I’m afraid of moving vehicles, including the ones I’m powering. Still, I like to ride my bicycle and I thought it would give me some confidence on the road if I actually knew the laws for riding my bike on the road. I expected it to be overwhelming, given the propensity of lawmakers to make complicated laws. However, for bicycles, it is pretty straight forward. 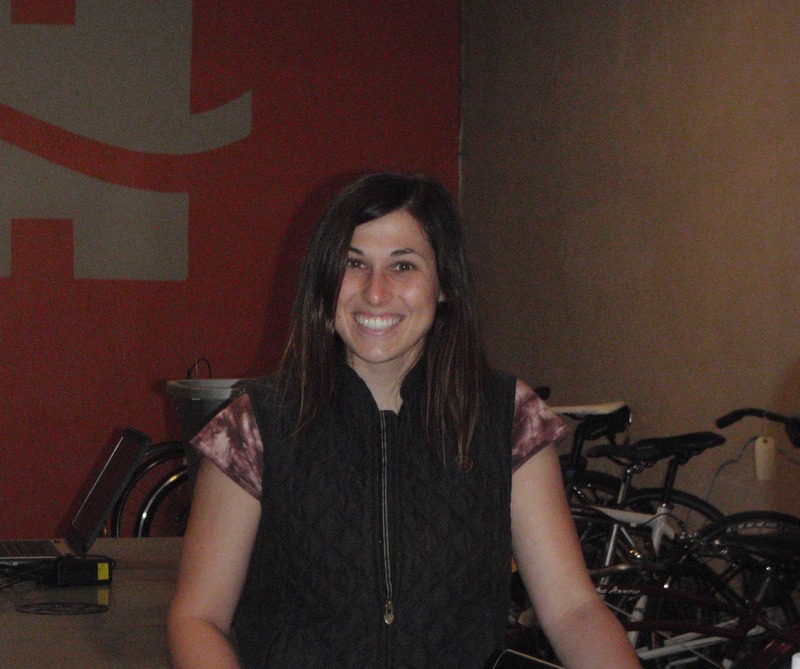 There were a few surprises, in the favor of making bicycle transportation more enjoyable. Here is my summary. Bicyclists have the rights and duties of any vehicle, unless something doesn’t have an application to a bike. Bicyclists are required to be careful. Duh. Stop signs mean a bicyclist must only SLOW down enough to determine safety, and to yield right of way if necessary. Red traffic lights must be stopped at, but you don’t have to wait for a green light to proceed if it is safe for all involved. The bike must have an attached seat. Only the number of people the bicycle is designed for may ride it. This does not include young children secured in a proper pack. Riding should be done as close to the right hand side of the road as is “practical,” except to pass, or when turning, or to avoid hazards(which can include roadside gravel and uneven roads). Two riders abreast is the limit on roads. Don’t impede normal or reasonable flow of traffic. Never try to carry so much that you can’t have at least one hand available to control the bike…. Signal turns at least 100 feet ahead, unless you need both hands to maintain control of the bike. No racing on roads allowed except for approved events. Reflectors or lights with visibility up to 500 feet are required for nighttime riding. Give audible signals when overtaking and passing pedestrians in places designated for them to walk. Pedestrians have the right of way on sidewalks. There may be special areas where bicycles are prohibited. If you want to read all the Idaho bicycle laws for yourself, they can be found here. Keep in mind that they might be different if you visit different states. For instance, I ran across an article saying that bicyclists in San Francisco wish they didn’t have to come to a full stop at stop signs. Cities can have certain codes to learn about, depending on where you ride. They seem to be more variable in downtown areas. Most motorists and some policemen don’t know the details of bicycle laws. (I say this admitting that I just looked them up for the first time.) I have heard of incidences locally and afar where officers wrongly cited or intimidated bicyclists, thinking they were doing their duty. Many motorists think the roads are only for cars and bike riders have no business being there and they can be pretty vocal about it. Seeing as they are driving something that can smash a cyclist, this puts the bicyclist at a definite disadvantage. But, then, people generally have trouble getting along and communicating. Why should it be any different just because bicycles are involved? However, I now feel less helpless about going out for a ride. I will always ride with some fear because I know that bikes are just harder to see on the horizon and the memory of my face plant (you can read how it happened here) lives on vividly in my mind. At least now I know what is expected of me by the legislature. 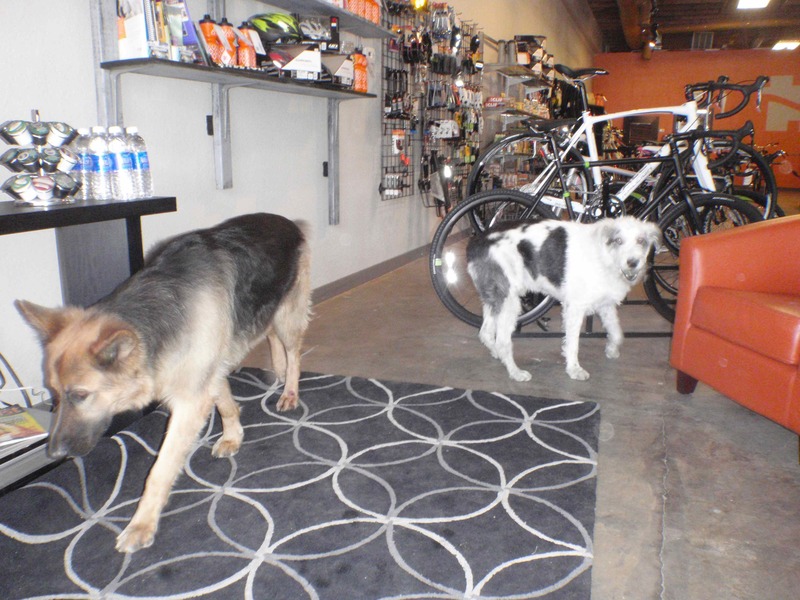 Some things are embarrassing to ask about at the bike shop. Like, “Do you have a special seat so that I will not be rubbed raw and in constant pain?” And then you find out that nearly EVERY serious rider has addressed this issue! Not that I’m calling myself a serious rider, but I have put some serious effort and miles into my road bike training. 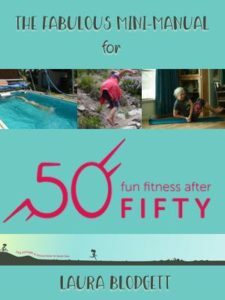 Once I started to increase my biking mileage over 45 minutes regularly, I developed shockingly sore spots. I tried adjusting my form. 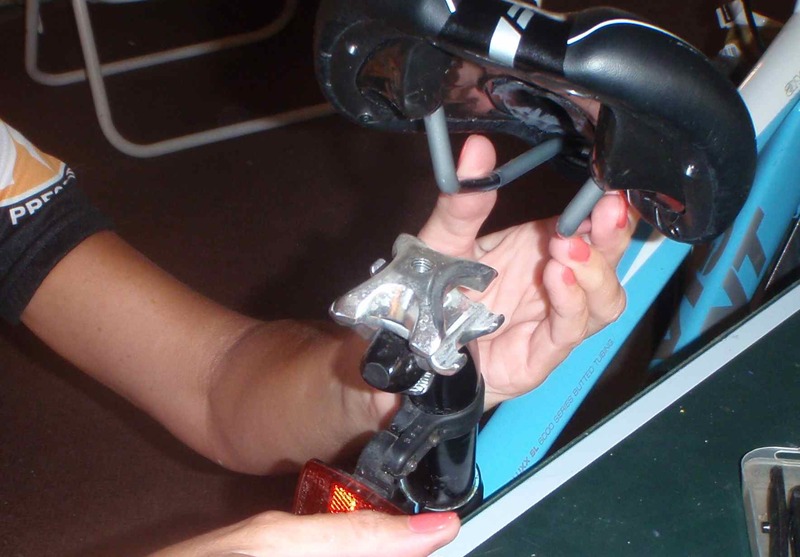 I got help modifying the angle of the nose of my bike seat, which in biking circles is called a saddle. These things helped a little some days. I never got around to trying a Noxema buffer, as was recommended, though I did use vaseline a couple of times. It didn’t seem to make enough difference. When someone mentioned the design options of bike seats saddles, I felt a desperate need to get one that would relieve pressure points. The folks at Rolling H Cycles let me borrow two saddles to test drive. One had a split middle, still being attached at both ends. The other one had more padding and an open split all at the hind end. The next step was learning to get bike seats on and off. I had never looked at it closely before. My husband showed me the correct tool (an allen wrench) and let me fiddle with the attachment metal. It took me a while to figure out that the top metal piece needs to be turned sideways for the bike saddle to slip off. There was no need to loosen the bottom bolt as much as I had at first. 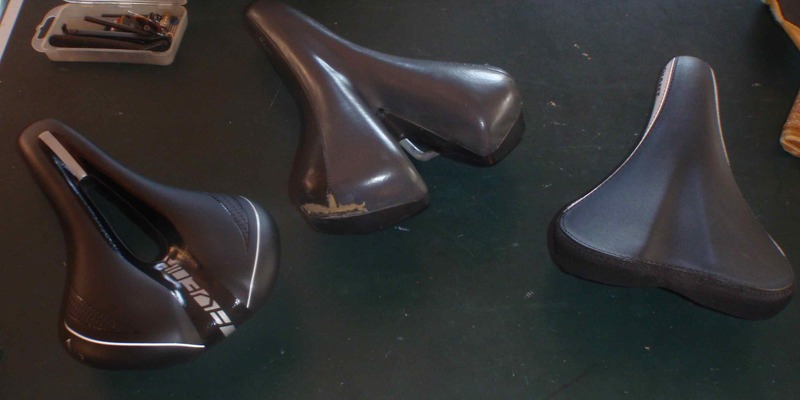 Now, I can remove and replace the saddle in a couple of minutes. To remove the bike saddle, only one screw underneath must be loosened, then the top metal bracket can be lifted and turned, which releases the saddle. 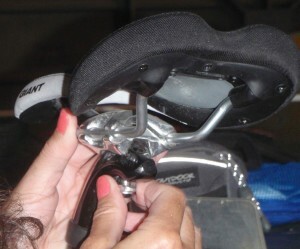 That top bracket tends to swivel right into the position to hold the bike saddle on, even after the saddle is removed. I rode each test saddle on our street in front of the house. I could tell right away that I preferred the middle split. 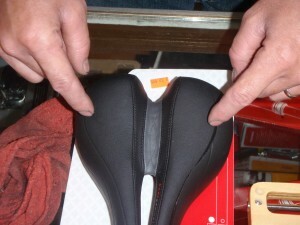 The other was not appreciably better than the original saddle on my low end road bike. I rode a training ride that morning of 16 miles and was so much more comfortable. Before I made a purchase, I decided to ask my bike savvy girlfriend what she uses. Don’t ask me why I hadn’t done this before. I had asked her a lot of other bike questions. All I can say is that it takes time to work out what to ask even when you know there is a problem. One must be measured for this type of bike saddle, to make sure that the “sitting bones” end up on the gel portion. This is done by sitting for about 15 seconds on memory foam, in position that approximates the angle at which the bike is ridden. I was asked specific questions about my bike and the height of my handle bars compared to my seat. I ended up being “medium” is all respects. The sitting bone imprints are distinct. The sliding markers will be moved to accurately measure the distance between them. The instructions on the back remind everyone how to measure correctly. 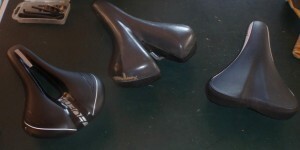 Where my sitting bones would sit on the Specialized Women’s Dolce Sport Gell Saddle. I was so happy to be told that they had my size in stock! With the triathlon less than 2 weeks away, I had been worried about order time. I felt like a little kid as I walked to the car with my new bike seat. 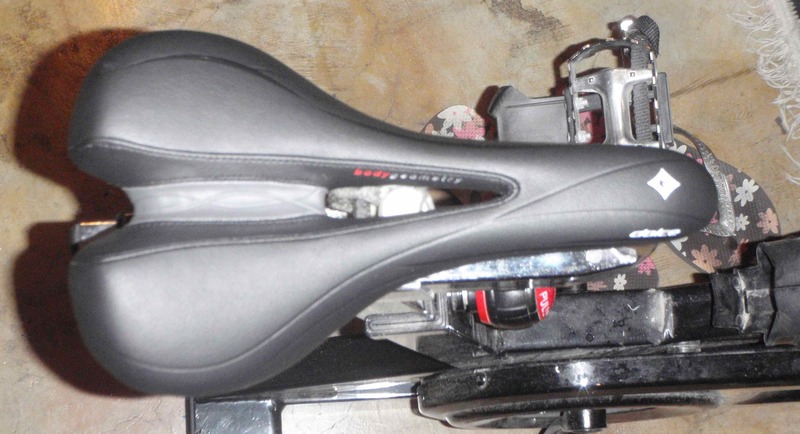 It was too hot to go out on my road bike that afternoon, so I decided to check and see if it was interchangeable with the seat saddle (for some reason, I feel strange calling it a saddle) on my spinning bike in the basement. I would probably have given up the idea upon seeing the different type of connection, but my husband had tools all over the floor due to working on his spinning bike. There was a socket wrench laying within arms length and it looked like that’s what I needed. It was a different puzzle getting the new bike saddle on the spinning bike, but at least it was possible. I don’t think I have ever used a socket wrench without supervision before. I got the bike saddle all the way on and off before I figured out that I was using the wrong size socket. Does that mean I have “special skills?” It does explain why the socket wrench kept slipping off, falling several times to the floor, and one time on my toes leaving a grape purple bruise. When I couldn’t get the saddle tightened enough to not slip around, it occurred to me to look for a size smaller socket. voila! The saddle was secured! I proceeded to ride on the spinning bike for 90 minutes in relative comfort. The longest I had ridden previously was 75 minutes, which took mental fortitude. Now, I think I need to go get a duplicate saddle, because, even thought I CAN do it, it is NOT as straightforward to get the saddle on and off of the spinning bike. So, there you have it. 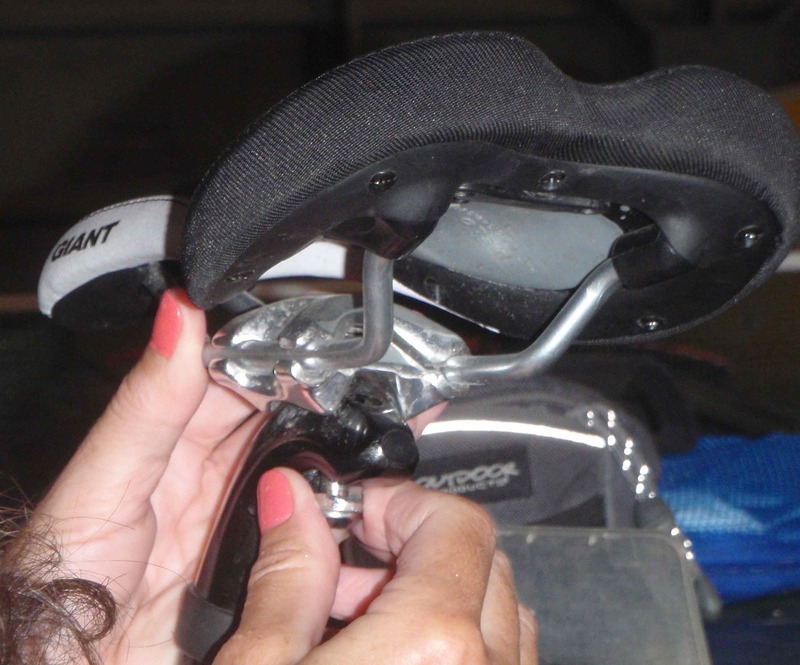 I not only have a new high tech bicycle seat saddle, but I am already thinking of getting another. Maybe there are longer bike rides in my future now. My new specialized, high tech, comfortable saddle on my spinning bike for now. 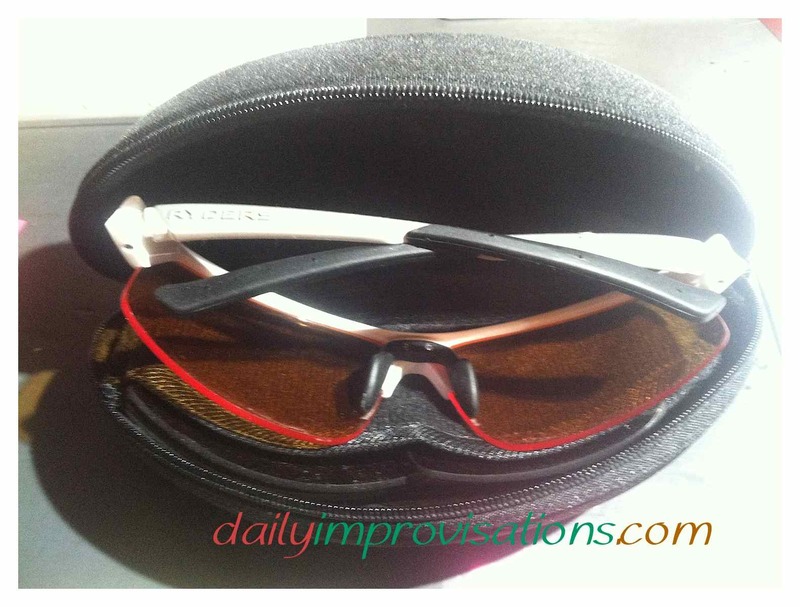 Have you ever wondered how much of biking gear is truly practical and what is just for show? I am learning that most of it has a basis in real perceived need, either for comfort or for safety. The items may be boldly decorated, but the foundational features are useful. Even the art can have some value. I wear a bike shirt that says “Biker Chick” because it gives me that humorous emotional edge to get on the bike with a positive attitude. I need this because that’s how my bike crash a few years ago affected me. Others may crash over and over and shrug it off, but not me. Some equipment is too small to make decoration worth while. Like bicycle gloves. 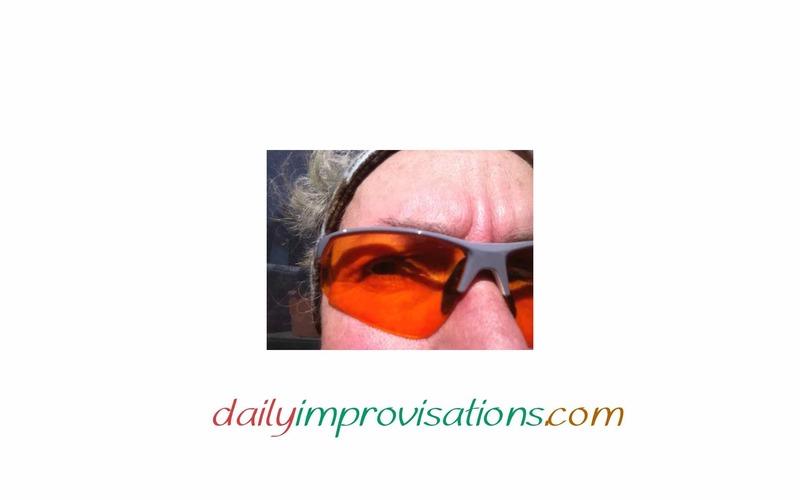 However, they still manage to add the cool factor, so I wondered if there was any advantage. I probably own more gloves than the average person. With a troubled history of eczema and related skin breakdown, I have some sort of glove for nearly every activity. Sometimes, I have variations for sub-activities and specific pairs of gloves in multiple rooms of the house. I have worn rubber gloves for cleaning or being a nurse; stretchy cotton gloves to keep oil on my hands for therapy; leather gloves for weight lifting or shoveling or driving; silicone coated gloves for gardening (I might own 10 different types of gardening gloves); polar fleece gloves for running. I have several options for winter needs. With all of these gloves, how could I need a special bicycle glove? 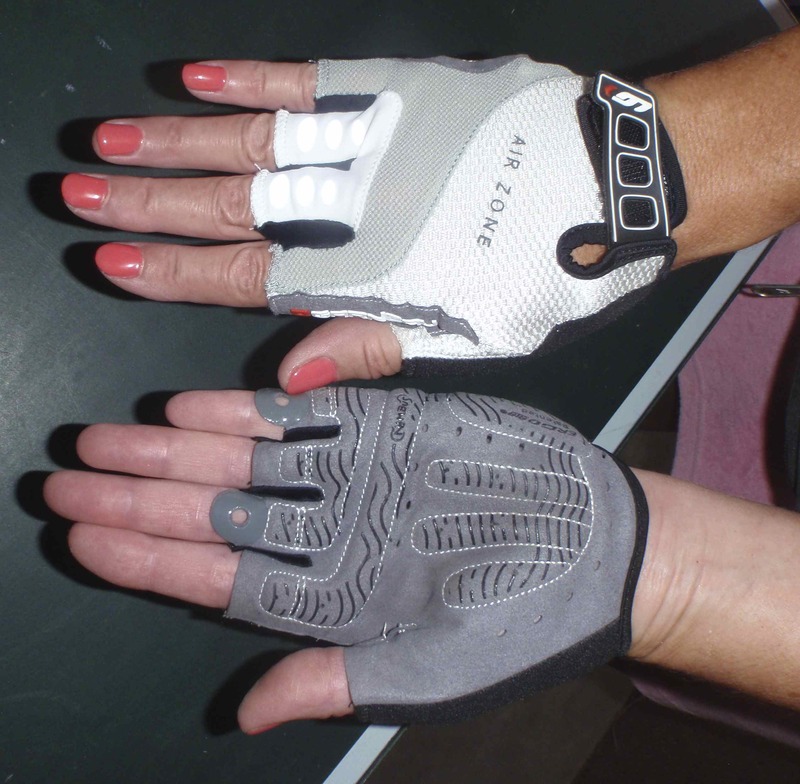 My new bicycle riding gloves, purchased from Rolling H Cycles in Nampa, Idaho. 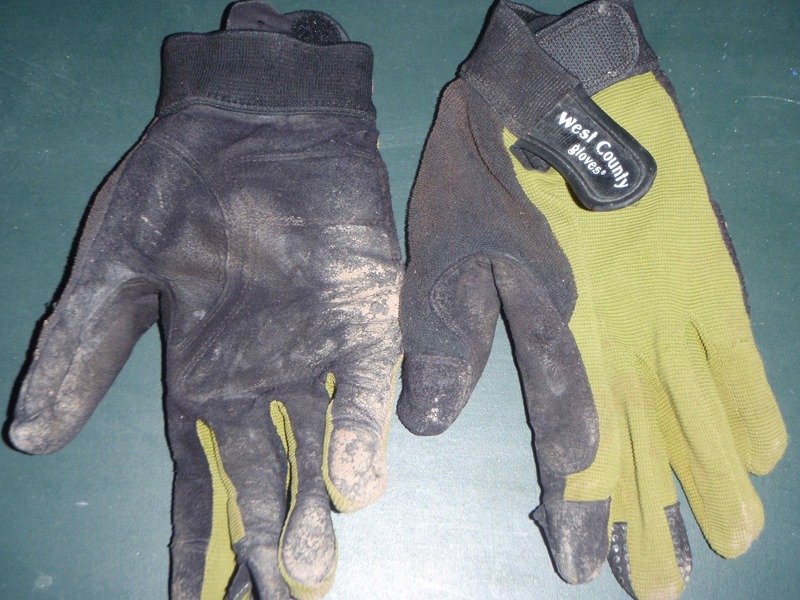 I had previously used either the weight lifting gloves, knit garden gloves, or my husband’s (one size too big) old cycling gloves. None of those fit me nearly as well as I wanted for riding the bike. In fact, these new gloves increased my riding comfort so that I felt like riding more than 30 minutes! 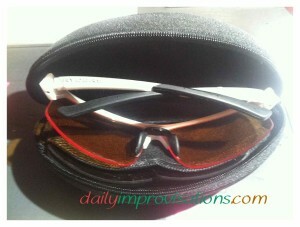 I have been riding 60 – 120 minutes for a couple of years, so I have given these other options a good try. But now, I have my bike gloves. I think I have earned them. Nick on the left. 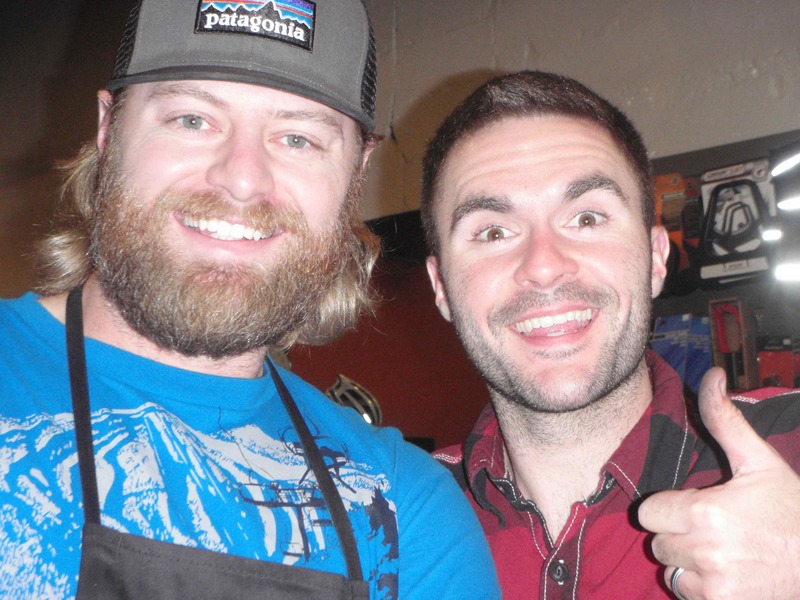 Adam Haynes, shop owner, on the right. Even the dogs are friendly at Rolling H Cycles. (you know it’s true if I am comfortable with them!) I played ball with one of them while I was getting my new bike rack a couple of weeks ago. His name is Bandit. 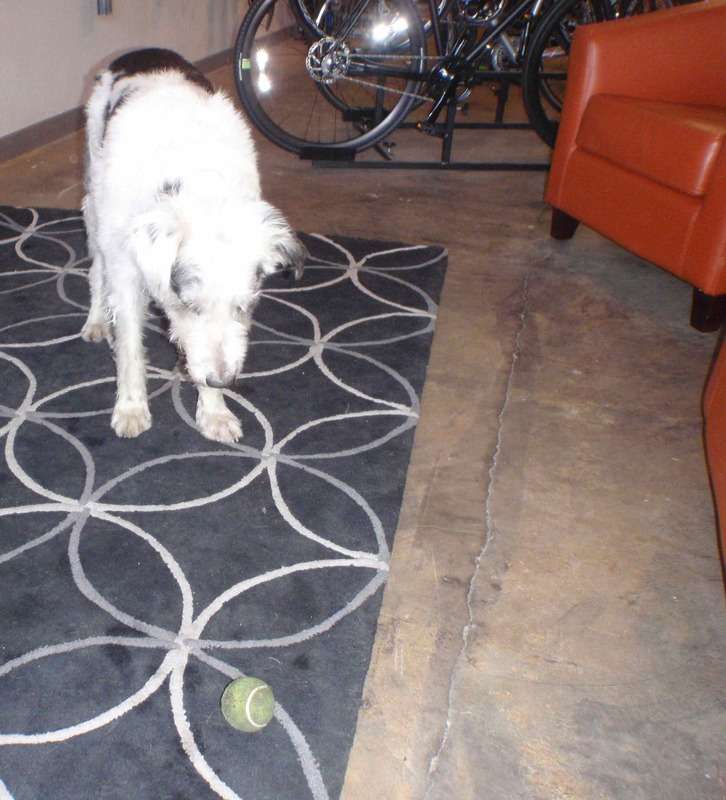 The shop owner/dog owner describes him as a 5 year old Aussie/Heeler mix. The other large dog periodically circled us with his rubber toy in his mouth. He is a 6 year old German Shepherd named Buddy. Maybe he’ll play with me next time. Since I rarely have kids to drive around anymore, I thought I might have more chances to use the bike for errands. This would hopefully be a low-key way to get some bike time. I won’t be doing major grocery shopping with the bike, but with a bike rack, I could make my ice cream runs, ride to the Rec Center for a swim, or pick up a few things at Walmart. 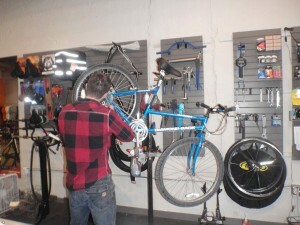 Adam Haynes, one of the owners of Rolling H Cycles, hard at work, still answers my questions. That was when I played with the dogs a bit. I had brought a book with plans for sewing some bike bags , so I also studied that project. Then, I thought of a couple of triathlon questions that I wanted to ask Adam. I wanted to know his opinion on dealing with aggressive swimmers. He said claim my space. If they are climbing up onto me, kick a bit harder. He says that if I can feel them, they can feel me and know what they are doing. I’m not being impolite to kick them in the face… they will just be more inclined to go around instead of over! Within half an hour, my new rack was in place and explained to me. Riding home, I did not notice any more weight or change in balance. I DID notice that I haven’t ridden the bike in street clothes for a while and need to wear a belt, as well as tie up my pant leg. So, now I am equipped, but I need to work on my habits and giving myself more time to get places. 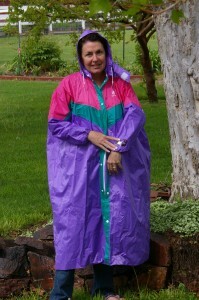 I may even try riding in my Taiwanese rain poncho when it’s raining, just to live on the wild side!